How are you, my friends?! Good, I hope. Filled with the joy of the Christmas season? I hope that too. I mentioned on Instagram (which is the optimal place to find me these busy days) that Christmas has been a source of stress in some ways in the past–because of my own self-imposed goals or a bad habit of trying to measure up to someone else’s awesome decorating or tradition-creating standards. This year (last year too) has felt considerably less hectic and demanding in terms of scheduling and my own expectations for myself. For which I am SO grateful! But! This year also brings with it the (familiar…this my the 3rd Christmastime pregnancy) challenge of trying to finish well with homeschooling, teaching at our homeschool co-op, and all of the other “necessary” things of the season while very, very pregnant. I know that I’ve done a terrible job of updating you guys here on the blog as the pregnancy has progressed (hence the Instagram plug, where I do a pretty decent job of posting regular pics), so I thought I’d take a second to give you the lowdown to get you up to speed. So, what is this baby anyway? Boy. It’s another boy! Honestly, we were thinking girl for the first half of the pregnancy because the same lady who has done 90% of my sonograms with the other kids said she was thinking it was a girl (at an early sono…13 weeks), and I had been leaning that direction with how hormonal/sick I’d been feeling. We had a girl name (that I looooove) picked out, and I’d even gone so far as to buy a couple of new little girl things on clearance here and there (I must admit I was a wee bit excited about the prospect of bows and frills after a 6+ year girl drought). And then, we had our 21 week bio-physical sonogram. The technician asked us if we already knew gender, and we said that we had an inkling. And then, he swiped the wand across my belly, and that inkling did a 180 in about .2 seconds. Disappointed is not the right word to describe how I feel. I love my boys!! And I think it will be so fun for Theo and Honor to have their own little band of Three Musketeers. But I still had to perform a bit of a brain adjustment after thinking of this little one as a “she” for so long. I wasn’t the only one either. When Shaun walked through the door and informed our way eager-to-know offspring that we were having another boy, Nola burst into devastated tears! Good thing we’d had the forethought to bring home a GIRL puppy at the exact same time, right? No. We didn’t. Have the forethought, that is. We DID, however, providentially bring home a puppy. I say providentially because we couldn’t have planned what a consolation she would be, even if we’d tried. We had been thinking/praying about a dog for a while but had no definite plans of getting one immediately, until Shaun just so “happened” to check around, and there just so “happened” to be a litter of beagle puppies (the breed we were most interested in) available in our area, and the lady just so “happened” to volunteer to meet us after our sonogram appointment for us to choose between the two remaining girl puppies she had. We chose this little cutie–a red-head we named Ruby. She has a penchant for snuggling in my lap, bombarding me with SBD’s (silent but deadly, natch) every night and tearing around like toddler on crack a good portion of the rest of the day. Unless, we have a fire going. In which case, she curls up in front of it for about 4 hours at a time, only taking breaks to eat, drink, and pee on the floor if we don’t remember to take her outside (turns out I’m way better at potty-training humans than dogs). You have never seen a little girl dry her tears and replace her expression of woe with glee as quickly as Nola did! Yeah, we planned that (no, we didn’t). Ahem. But back to this pregnancy/baby. Aw, thanks for asking, guys. The short answer: pregnant. Very pregnant. I mean, I feel fine. And I’m still able to do everything “normally,” but I feel like my belly is growing by leaps and bounds every day, and this is for sure the biggest I’ve ever been (belly-wise) at this stage. In fact, I was a bit shocked to discover that I was measuring where I should at my last midwife appointment, since I have always measured behind every other time except with the twins (with whom I measured “on time” for a singleton). The difference between the size/look/feeling of my belly in the morning and the evening is laughably huge (pun intended). I start out the day looking small for my gestational stage and end it FEELING like a whale…and looking considerably, ahem, rounder. For the record, the above 32-week pic is after lunch, so it’s a pretty true representation of my current belly state. Also, I really feel like my birthday (last month) and Thanksgiving have made considerable, generous contributions to my burgeoning belly. I imagine Christmas will have something to say about it too. So, when I consider that plus the fact that, at 32 weeks, I probably still have 10 weeks to go (since I’ve gone to 42 weeks 4 times already), I’m feeling a wee bit nervous about the prospect of a 10 pound baby (Honor was 9 lb. 1 oz, so we shall see). We do! Although, it took a bit more convincing (from me to Shaun) than usual. 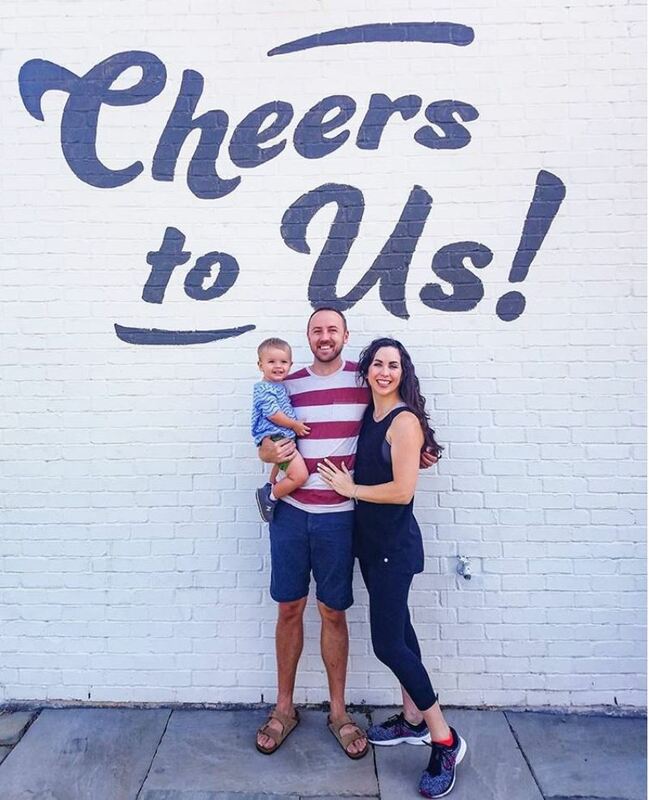 I’m not sharing it until he’s born, but, if you’ve read my “name game” post, then you know that it has to (and does) match our family name aesthetic. Anything new this time around? Not really. Although, the round ligament pain has been considerably more intense/frequent than ever before. My varicose veins (in my right leg only) continue to worsen, despite (intermittent and halfhearted) efforts on my part to treat them with compression, oils, and supplements. Well, I will say that they aren’t hurting too badly these days. But they SURE are ugly! Other than that, it’s business as usual. Braxton Hicks contractions just returned about a week ago, which is a bit later than the last two pregnancies. I still sleep much better than any very pregnant woman has a right to every night. And I’ve resumed my pattern of pregnancy-induced snoring if I every flip over on my back at night (Shaun’s favorite…although, he’s the best sport about it). 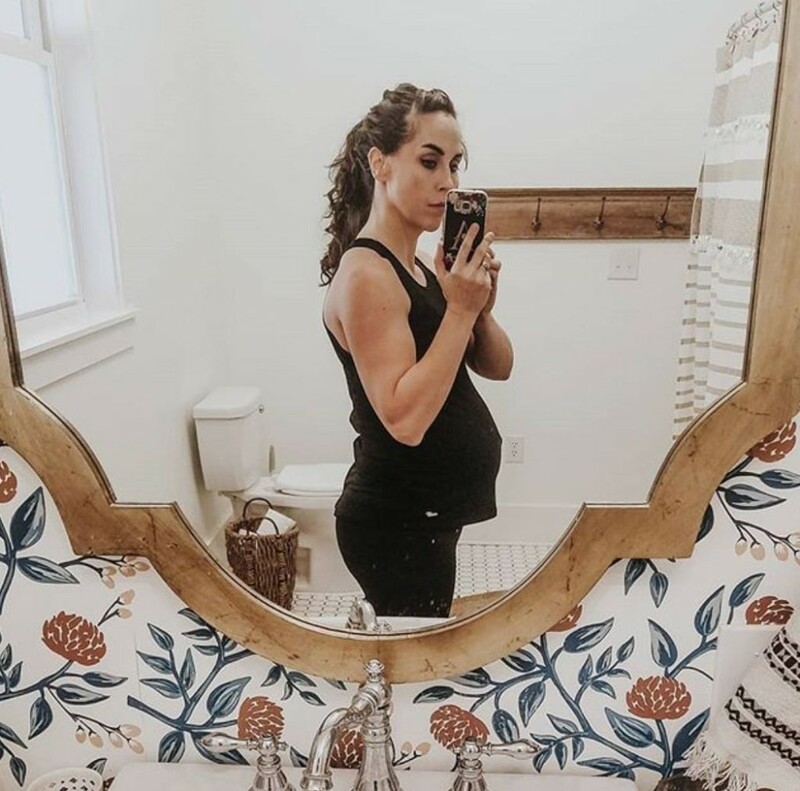 Compared to others who spend their entire pregnancy vomiting or fighting debilitating sciatic nerve pain, my pregnancies are a dream. Doesn’t mean I’m not ready to be done already. Because I am. If only there weren’t that whole pesky labor business to get through first. (Oh, and the fact that, of course I don’t want my baby to come at 32 weeks for his sake). 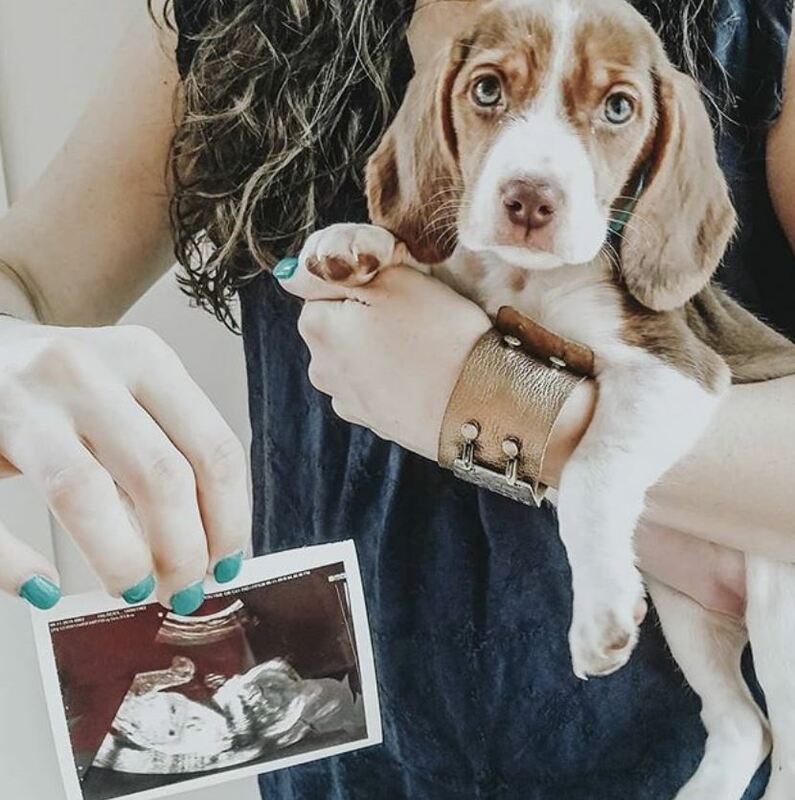 Any big plans for labor? Yes! Have a baby at home with as little pain and time spent doing it as possible. As a veteran of protracted, (normal-level) painful labors, I am fully expecting another hiccupy, long, grueling labor with this one. But! I’m still asking for the Lord’s mercy in a couple of things: 1. That my water would not break ahead of time. If you recall, this happened for the first time with Honor, and the contractions were, by far, the worst I’ve ever experienced as a result of not having that amniotic fluid cushion. And 2. That I would be able to deliver in the water again. I was able to with Honor (every other time I’d tried, it had killed my contractions), but I think that’s because his contractions were so strong/agonizing/freight-trainish at the end that nothing was going to slow them down. Aaaaand there you have it, folks! Honestly, other than more frequent pictorial evidence, you haven’t missed just tons. I have (thankfully) uneventful pregnancies on the whole, and this one has followed that pattern so far. Oh! And just so you know (because people always ask), I am doing my Amazon Gift Guide again this year, so there will not be another 3 month gap between posts. In fact, I hope to have the first installment done in the next several days. Lord willing. We’ll see. ALSO, just so you know, we have a Paint and Prose sale going on right now (40% off with the code CYBER40) through Saturday, which will be your last chance to snag prints at such a big discount before Christmas. Hey guys! 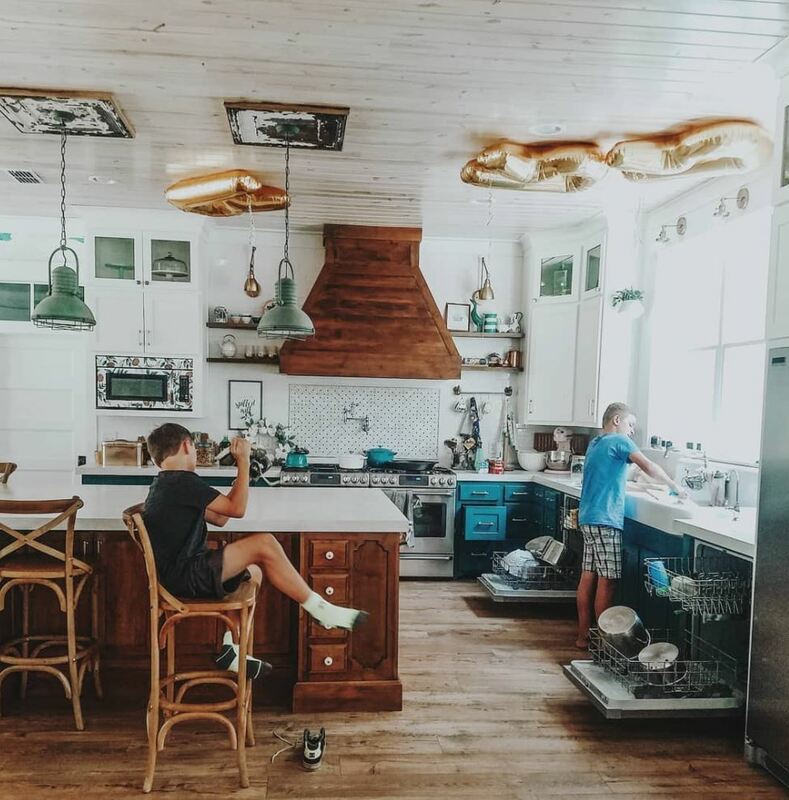 I promised you another homeschooling post a while back, and, since then, I’ve had several requests for a post about how I “balance it all.” I have that in quotation marks because, depending on the day, I don’t. But! 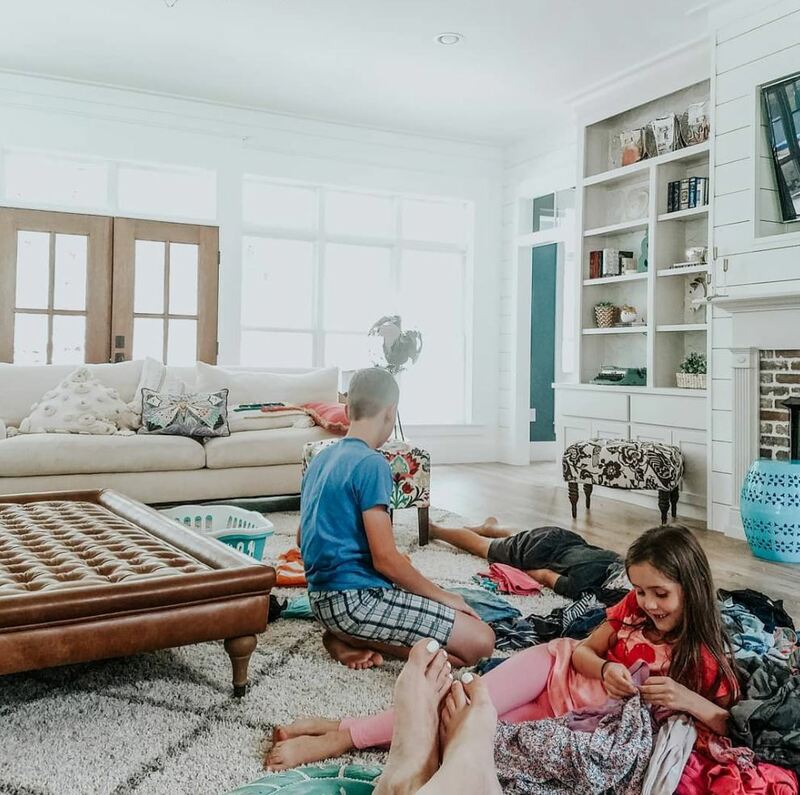 I will say that we have a pretty good rhythm at our house at this point, and I’m better about saying, “No,” when necessary than I used to be, so I feel like we actually strike a pretty decent balance between chores, school, and play these days. Of course, I say that now, and we haven’t officially started homeschooling yet (we just did reading + math all summer). That’s this week. But! I can give you a rundown of what a basic day-in-the-life looked like from last spring and what I anticipate it to look like this semester as well. Monday is our co-op day, and last year, it consisted of my teaching Body Pump at 5:45 AM, then hustling home to shower/change, while the kids made/ate breakfast, got dressed, gathered their co-op supplies (which we had packed the night before), and did their morning clean-up. We were out of the house by 8:15 and finished with co-op (where I teach high school Spanish, and the kids all play or attend various classes all day) by 3:00 PM. I dropped the oldest 5 off at piano lessons, while the little boys and I rushed through a few errands, before picking up the girls for dance, taking them over to the dance studio, then doing a lightning run at the grocery, picking up the girls at dance, the boys at piano, and then heading home to finish dinner, eat, do evening clean-up, a bit of read-aloud, and then bedtime routines. At which point, I usually collapsed in a coma on the couch. It was the longest day of the year every. single. week. THIS year, the first 2/3 of the day looks the same, but we don’t have piano lessons immediately after co-op (they’re on a different day), and the girls’ dance studio is only 3 minutes from our house this time around, so we’ll be home by 3:30 and have a bit of time to recoup before dance, which is a huge relief. We *technically* started co-op last week for meet-the-teacher and had to come home and finish all the chores that we hadn’t completed in the mad rush to get our homeschooled selves out the door by 8:15. So! Since Monday isn’t exactly representative of the rest of the week, and I just gave you a rundown of that already, let’s go with Tuesday because that’s pretty much the most ordinary day of the week, right? I’m usually up between 6:30-6:45 (except for mornings that I get up at 5 AM to teach, which are Monday and Wednesday), and the kids get up at 7:00 during the school year. We eat breakfast, do family Bible reading, and then start morning cleanup. Clean-up usually lasts until 8:30, 9 at the latest…unless we all are dragging that morning. The kids and I review our memorization (verses, poetry, etc.) for the week, and then everyone starts on his/her independent work. The older kids do their math, reading, spelling, and vocab exercises, while the twins and I read and do math and handwriting together. They would technically only be in kindergarten this year, since their birthday isn’t until September 24 (they’ll be 6), but we’ll be working on mostly 1st grade work this year, since they are already reading at a beginning level just fine. I check on the bigger kids’ work and look it over/grade it during this time as well. And Honor and Theo play/fight. Since last March, a group of 3-6 girls from our church has been coming to our house twice a week to exercise together. They arrive at 11:15, and I pay Ezra and Simon to babysit their kiddos. At certain points, we’ve had as many as 20+ kids in the house, but the boys handle it really well, and it’s usually more like 10-15 (including mine). The moms are just upstairs, so if there’s a kiddo who needs our attention, we’re right there, but it’s nice to be able to exercise in relative peace and, um, well, not quiet exactly. But, it gets the job done. The girls that come to exercise are usually gone between 12:30 and 1, and we eat lunch. Honor usually goes down for a nap between 11 and 12 and sleeps until 2, so after lunch, Theo goes down for his nap, and the rest of the kids and I meet in the living room for read-aloud + laundry folding (they fold, I read; it’s fabulous). The twins are usually drawing during folding/reading, but their job is to take all of the baskets of folded laundry to the correct rooms. Clearly, Simon was into both the folding and the book. The twins have rest/play time in their room while the older kids work on co-op homework, science, grammar, and history with me. Theo takes somewhere between a 1 hour and 2 hour nap, depending on his level of tiredness, so he’s up by now, usually wanting a snack. Honor’s up too, and, honestly, eeeerrrr’body wants a snack/break at this point. They usually get their own/take care of each other while I start dinner prep, flip the laundry, or just chill for a bit. At this point, the older boys go out to water the flowerbeds, and then everybody has free time and usually spends it drawing, playing, reading, fishing, jumping on the trampoline, or helping me finish dinner prep (the twins and Theo are especially keen on that one). Tuesdays are usually our library day, so we head there for about 30 minutes before heading back home for dinner. (It’s 5 minutes away…one of the many things I love about living 10 minutes closer to town than we used to). EXTREMELY RANDOM TANGENT: Did you know that there’s an actual thing called the Mariko Aoki phenomenon, which observes that being in both libraries and bookstores has been linked with the urge to, ahem, poop. I observed it for myself when I noticed that Honor gifted me with a stinky diaper pretty much every time we visited the library, and then, when I posted about it on social media, I got sooooo many “mine toooo’s” that I had to investigate. Wonders never cease. Dinner. It doesn’t take us an hour to eat, but we usually spend a good 45 minutes around the table. We have an Alexa timer set for after dinner clean-up. We’ve been doing this consistently for over 8 months now, and I absolutely LOVE the difference it makes in all of our moods (but, let’s face it, mine the most) to go to bed with the dishes done and the downstairs picked up at least. The kids usually do something fun with Shaun at this point. He works from home, but he’s not usually available between 8 AM and 5 PM (at least), so this is the kids’ time to roll around on the floor or play ping or darts with their daddy. Honor goes to bed around this point as well. Bedtime routines. During the summer, we don’t usually start these until 8:20 or so but we try to stick to 8 during the school year. Bedtime routines consist of teeth-brushing, potty, water, kid Bible reading (the older boys read a story to the younger kids and briefly discuss it), and any other nonsense, er, reasonable rituals that the kids feel attached to (i.e. making sure they know where their favorite sleep toy is). It usually takes about 20 minutes, so, most nights, everybody is heading to bed by 8:30. With kids in bed, dinner stuff put away, and the house in decent shape, Shaun and I have some time to chill on the couch and talk about the day. We usually read or watch a show starting around 9 (our repertoire is very small, since we’re picky about what we watch, but we recently finished watching the first two seasons of The Man in the High Castle on VidAngel…wouldn’t recommend it unedited, but it’s an interesting watch with all of the junk edited out). By this point, we’re at least headed to bed, but when I don’t get up at 5, I usually manage to find something to occupy myself (ahem, catching up on Instagram) that means I end up going to sleep closer to 11. This has nothing to do with what we look like when we are vegging on the couch, but this was how we felt the other day when my mom had the oldest 6, and Shaun, Honor, and I got to sneak out for a croissant at a local bakery when Shaun got back from a work trip. Aaaaaaaand there you have a typical Tuesday in our house. Obviously, there’s a fair bit of flux in our schedule, depending on whether we have appointments (for example: my midwife only takes appointments on Tuesdays, so we’ll be adding that to our schedule this fall). And when Shaun’s gone on work trips (which he always does more in the spring and fall), Tuesdays are our nights to go to the gym for a bit after the library and then Chick-fil-a for dinner. 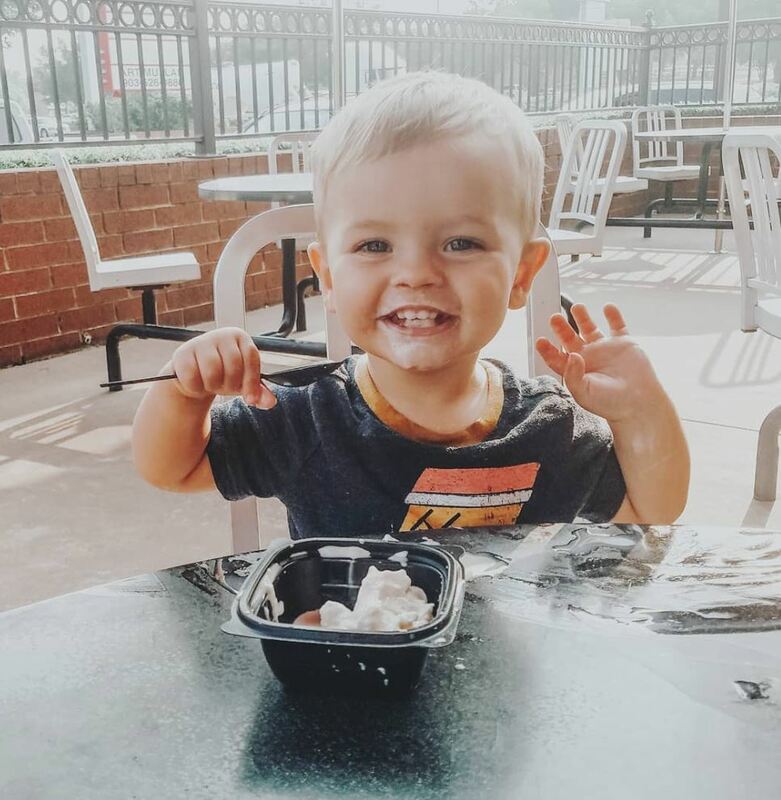 Honor might be a slight fan of Chick-fil-a nights…even if he does miss his daddy something fierce. And I think it’s pretty obvious that there are no hard and fast scheduling rules here. Some days, we finish all of our schoolwork in 4 hours (the older ones), and some days, it takes longer. Some days, shorter. We’re out of the house some days more than others, but, I’ll be honest: the majority of our days are spent at home. We wouldn’t be able to get everything done if they weren’t. In case you’re wondering, Wednesday looks very similar, except that I teach early in the AM, the girls don’t come to exercise, and my mom comes to help with homeschooling around 10 AM. She leaves at 3. Then, at 4:30, I teach another class, usually while the kids stay home and watch a show (which is one of their only opportunities to have screen time during the week) and fold clothes (Shaun is home but working in his office, which is on the bottom floor). Shooooo-wee! That was a lot of words about the boring stuff I do all day (boring in the “ordinary” sense…I don’t find it boring). What about you guys? What does a day-in-the-life look like for you? Anything I skipped that you were dying to know? I’m happy to answer!